This is a small 200pt force I’ve completed for Muskets and Tomahawks. Led by French officers I’ve got a detachment of regulars supported by a two groups of Indian auxiliaries. You don’t get a lot of regulars for your 200pts (about a dozen men, ten Indians and an officer). But once they form a line with an officer nearby they’re very solid, with good firepower and the inclusion of the Indians gives the force some limited ability to mix it up in the woods. Fielding the Indians with the “auxiliaries” trait means they can use the morale of the French officer, which means the force can move through terrain with the officer leading the Indians in the van while the regulars trudge slowly through the woods behind. Obviously the preferred option is to march up the road with bayonets fixed and colours flying, but you have to be ready for “loose files and American scramble”. 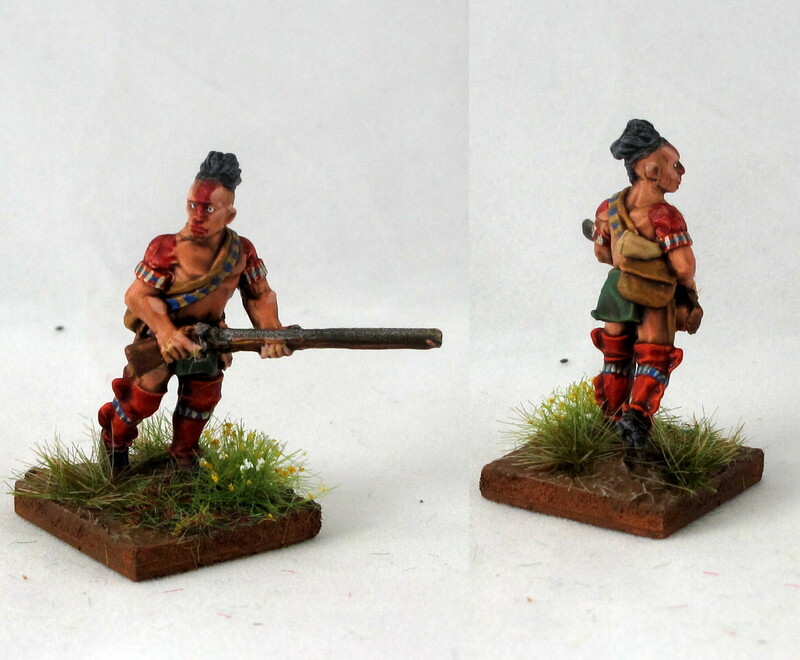 The Indians are from the Perrys’ AWI range and I’ve already posted about them here. Like all Perry stuff they’re slightly smaller than some, but the Foundry regulars aren’t massive so they work together. Ten of them will give me two groups of five, which makes them a little fragile, but the maximum you’re allowed is only six anyway. Their job is to contest any terrain features that enemy irregulars might be using to try to even the odds in a fight against the regulars. Having two groups of them allows me to put down three hidden movement markers when they’re scouting (one being a dummy). So there’s a bit of sneaky deception shenanigans available. 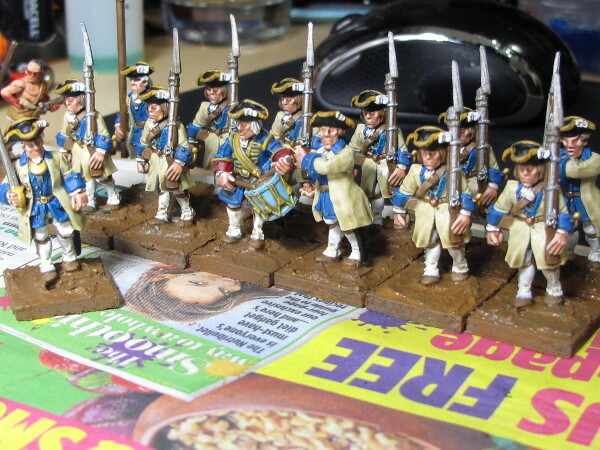 The regulars are from Casting Room Miniatures French Seven Years War range. If that name is not familiar to you it’s because Casting Room is an offshoot of Foundry. I actually bought these figures in the Foundry shop, in Foundry packaging. I used to be a Foundry fan but for some reason stopped using them so much. That might have to change, because I found these miniatures really enjoyable to paint. They had negligible flash and mould lines, and good strong detail that makes life easy on numpty painters like me. I can’t really comment on the posing, most of these guys are standing at attention so there ain’t none! The faces tend slightly towards caricature over realism, but I quite like the slightly haughty look of these guys. They really look like they’re sneering at all the grubby colonials lurking in the trees and doing cowardly things like firing prone. The cads! To be honest I don’t think I’ve really done them justice. The Indians came out quite nicely, but I’m just not that happy with how the French have. Good enough for the tabletop though, and that’s the main thing. The command pack contains a drummer, two officers, a sergeant and two standard bearers. I turned one of the standard bearers into a fusilier by giving him a musket. One officer has a drawn sword and the other a musket, either is fine for M&T as is. The flag is just one I downloaded and printed out at home. They’re all based on magnetised 20mm squares from Tiny Tin Troops, I like to use squares for M&T because facing does matter, and troops like these that have the “firing line” trait do need to rank up. I’ve gone for lots of shrubbery on the bases, it’s the French and Indian War and these guys are out in the wilderness. Soft Tone Quickshade applied and only faces highlighted. It’s left the whites nice and bright, but hasn’t shaded things like the muskets enough IMO. Due to the lighter colours on them I tried using Army Painter’s Soft Tone Quickshade on them. The effect is much more subtle than the normal Strong Tone stuff. Too subtle I think. I reckon it’s worked fine for things like faces that you’re going to go back and apply highlights to anyway but other stuff that I normally just leave with basecoat and quickshade (such as the metal parts of their muskets) I had to go back and wash in black because the Soft Tone just hadn’t done enough. In future I think I’ll be reserving Soft Tone only for areas that are white or very light colours, and brushing Strong Tone on the rest of the miniature. I’ve done similar for my WW2 Germans where I used Dark Tone on the uniform and Strong for the flesh. It’s not as fiddly as it sounds, you don’t need to be precise. Just slap it on, you can sort out any issues when you tidy them up and highlight afterwards. Superb Andy! They look the absolute bees knees.